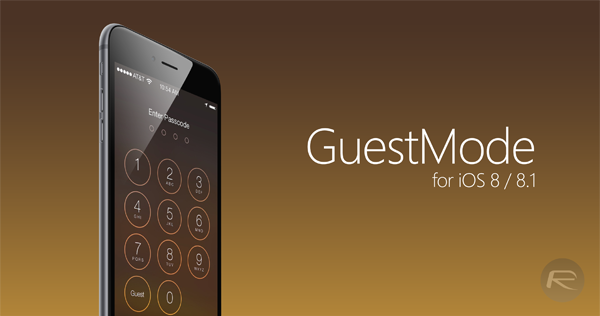 iOS 8 / 8.1 users can finally enable guest mode on their iPhone, iPad or iPod touch if they are currently jailbroken. Smartphones are still at an infancy stage when compared to desktop OSes such as OS X and Windows, or even Linux. Desktop OSes have allowed multi-user support for a while now, unlike smartphones which have only just recently become smart enough to actually support it. iOS never really went the multi-user way unlike Android Lollipop, but that’s what jailbreak is for. Earlier, iOS 7 users with jailbroken devices could enable multi-user support that wasn’t really multi, but allowed users to hand over the device to another person without having to worry about that someone peeking into your private stuff. 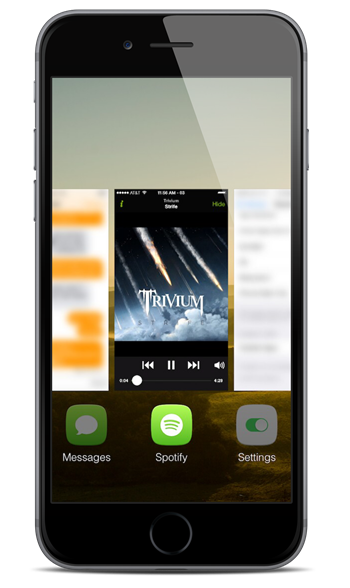 Available as a Cydia tweak, GuestMode from the BigBoss repository does exactly what the title suggests, however once iOS 8 / 8.1 was released and users updated their devices, a newer version of the tweak was needed. That update is here now and is backwards compatible as well, so if you’re on iOS 7 and didn’t know about this tweak, you don’t have to update to iOS 8 / 8.1 for it. 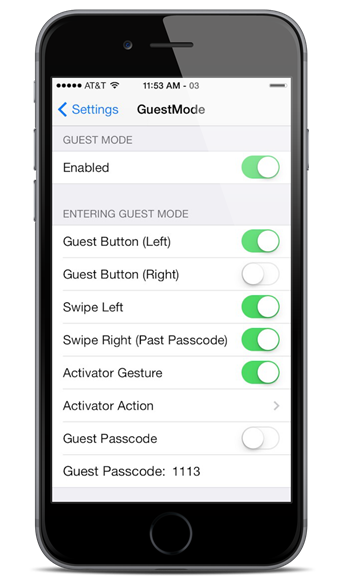 If you didn’t already know about this tweak, GuestMode lets you act as an administrator, allowing you to customize and control which app the guest has access to, so the next time you hand over your iPhone or iPad to a friend for controlling music playback, you can rest assured they won’t be snooping through your photo albums, Safari tabs or Messages etc.. The tweak is indeed well designed and well thought off given the level of privacy that a user now has over his device without needing separate lockdown or privacy apps. The tweak is available to download right now and it costs just $0.99, and can be found under the BigBoss repo in Cydia as we mentioned above. Let us know if you’ve been using this tweak on your jailbroken iOS 8 / 8.1 device, and how it fared for you in the comments section below. 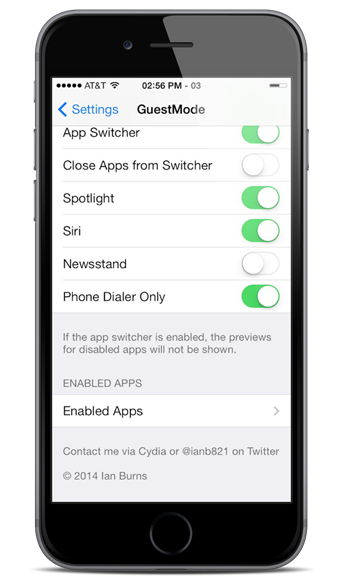 How can we buy it, to try it in iOS 8.1 if Saurik have not yet, turn on the switch so we can buy. Still at my end, unable to ourchase!!!! How do you guys download it then? And try it? I got so many tweaks that are now updated and can not download them because still unable to purchase. Im 38 yo…since 16 yo working with all types of techs!!! Im a fighter too…but love my techs!!! I was a dev in my younger years, so I do not want to pirate nothing, because I know how hard is to creat from zero, using c++, java, in linux, sun systems…and others languages and OS!!! But this problem of cydia is making me very frustrated and making me to use others ways for downloading and install the updates payed tweaks I love in my iPhone(plural)…english is not my first language just in case people!!! Is this available for iOS7.1? Purchases haven’t been enabled yet so we have to wait. Some people are spoofing cydia running iOS 7 and then purchasing. Once purchased on iOS 7 you can download your past purchases in iOS 8. If you have an old device running iOS 7 jailbroken you can also purchase that way. I jailbroke my ipad just for this, but I cant find it anywhere. How do you buy it? I can only find articles describing how great it is.